about one of baseball’s unsung heroes. Forget Clint Eastwood. I want the real thing. When will card shows wake up? 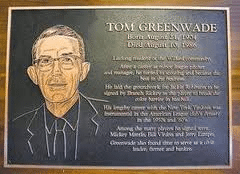 Tom Greenwade died 25 years ago. People were shelling out for Mickey Mantle autographs. Does anyone have a signed baseball from the man who discovered The Mick? I would have attended. Sure, some former players became scouts. However, their autograph gets collected anyway, just for appearing in a card set. Is there a whole legion of baseball scout autograph collectors that I don’t know about? Tom – Bowman did release two subsets of scout autograph cards in 2008 & 2009 for scouts who signed star players. Search eBay for Bowman scout auto & you’ll find a bunch!